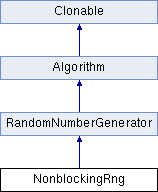 Encapsulates CryptoAPI's CryptGenRandom() or CryptoNG's BCryptGenRandom() on Windows, or /dev/urandom on Unix and compatibles. Definition at line 84 of file osrng.h. Definition at line 147 of file osrng.cpp.